Faithful reproduction of the worldwide famous “Black Dog”, one of the very favorites guitars of Joe Satriani, which was immortalized in the back cover of the “Flying In A Blue Dream” record. This was Joe´s main guitar for lot of years, which was decorated by Joe himself with his own drawings on the body. Undoubtful this axe is an icon of shred and rock guitar. 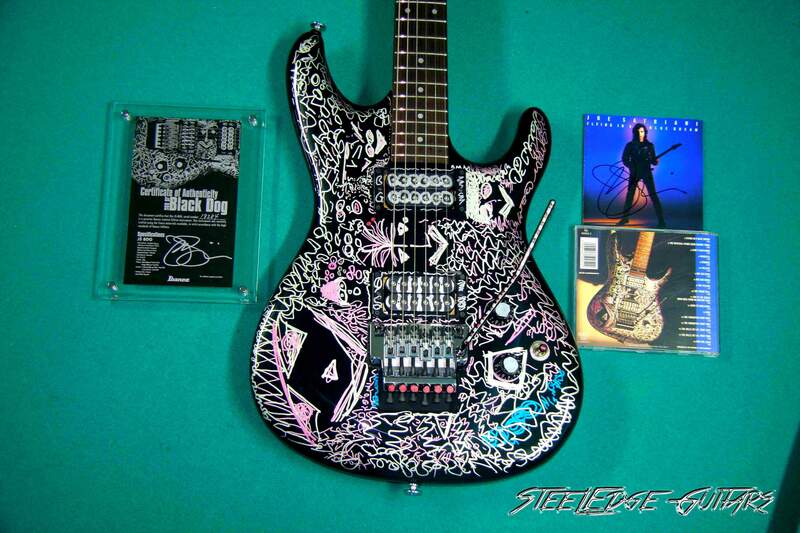 As some of you may know, I´m a die-hard Satriani fan, he is my favorite guitar player and one of the reasons why I play guitar, so this guitar means a lot to me, is the most special guitar I have after the Chromeboy JS10th Joe played himself and signed to me. Joe used the Black Dog guitar for years, having the Flying In A Blue Dream album recorded almost entirely with this guitar, and becoming one of the main axes ever associated with Joe Satriani. The JSBDG replica was released by Ibanez in 2008, and was limited to 88 pieces worldwide, which makes this guitar a very rare and collectible piece, all Satriani´s fans love this guitar and they don´t pop up for sale often.Blackdog is also the very first prototype from where all the JS Series guitars came from. The recreation features the original pot locations and output jack style. 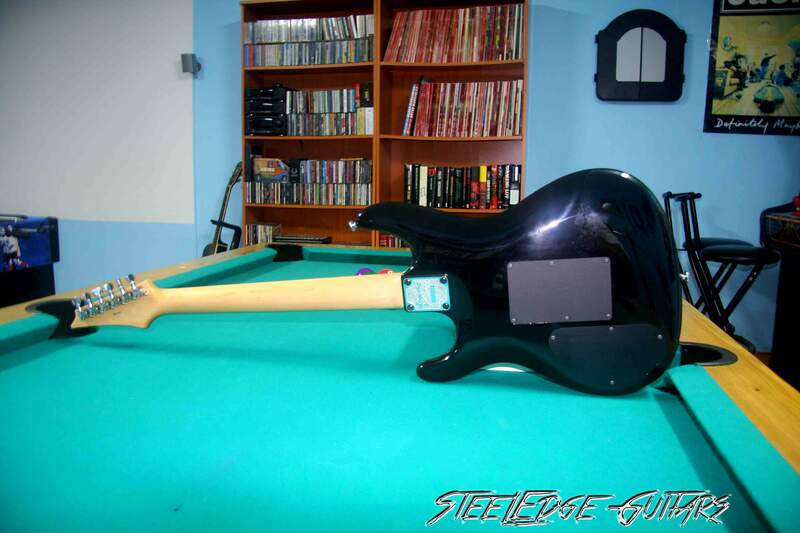 The guitar originally was a black Radius with a humbucker/single/humbucker arrangement, which had filled in the middle single-coil space with wood and refinished it in black. The neck was a Roadstar neck, so this is kinda “Frankenstein” guitar. 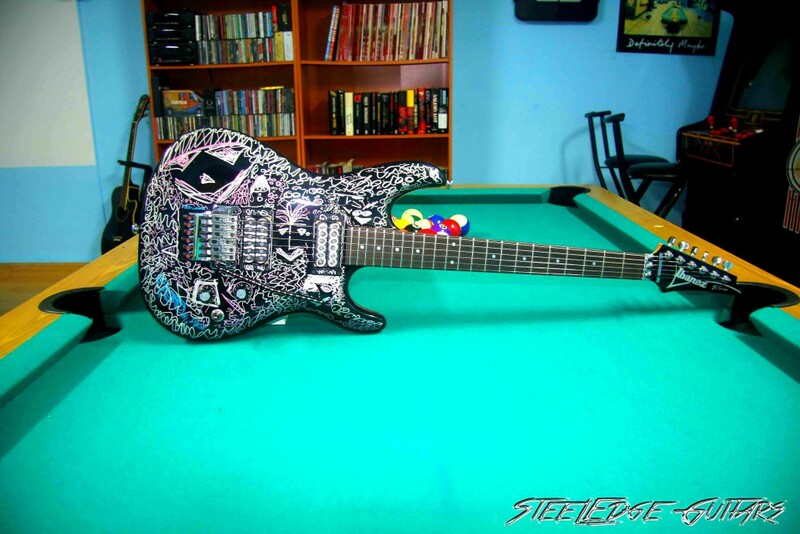 Joe used to decorate with colored metallic Sharpie markers at different times, so you can see in pics how the Black Dog look evolution through the years to the guitar that we know today. Is truly awesome see Joe playing this guitar, along with the Chromeboy, is the guitar that we most associate Joe with. I had the chance of seeing Joe live in Granada playing one of the Black Dogs replicas, but at first time I thought it was the original Black Dog, as the replica wasn’t released yet by that time. In fact, Black Dog was retired years ago, and Joe has been using one of the JSBDG replica he owns (actually, he owns 3 of them). 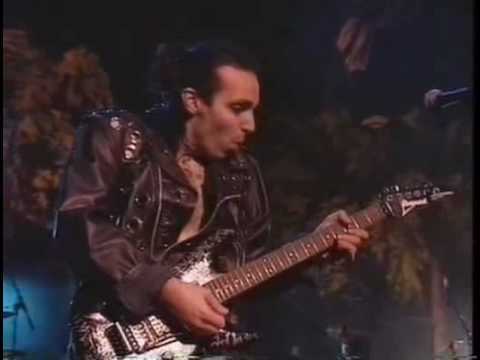 I had backstage passes for that show, and was talking to Joe for a while, when I asked him about how cool was bringing Black Dog back to the shows, and he told me that it wasn´t Black Dog, but a very exact replica that Ibanez was going to release very soon. In that moment, I immediately knew I had to have one at all costs. “The Black Dog prototype JS guitar started out as a black, hum-sing-hum Radius model that Ibanez sent my way for my examination. I was intrigued by the sound, and smooth contours of the body. However, we had to do something about the pickups, pots, fingerboard radius, frets, whammy bar, etc. So, it went back to the shop to have the single coil pickup removed, and the cavity filled and painted over. This was the first step in creating what would ultimately become my favorite electric guitar. To get the most comfortable and useful compound radius fretboard possible, we finessed the playing surface over and over until it was just right. This took quite a lot of time and experimentation. I wanted a vintage neck and fretboard feel, but wanted to be able to bend my notes anywhere, without ever fretting out. I also wanted the option of low action for two-hand tapping techniques. Soon, Larry DiMarzio and Steve Blucher got involved by supplying a few pickups for me, pickups that were essentially ‘Fred’ prototypes. We bent the whammy bar in an effort to get the perfect angle. We even tried many different lengths. San Francisco luthier, Gary Brawer, was working on Black Dog as well, testing and implementing many of my ideas along side the Ibanez custom shop. All this time I was recording and touring. Black Dog was my main guitar in the studio and onstage for years. The ‘Flying in a Blue Dream’ album saw the Black Dog used on every song, as well as gracing the back cover. 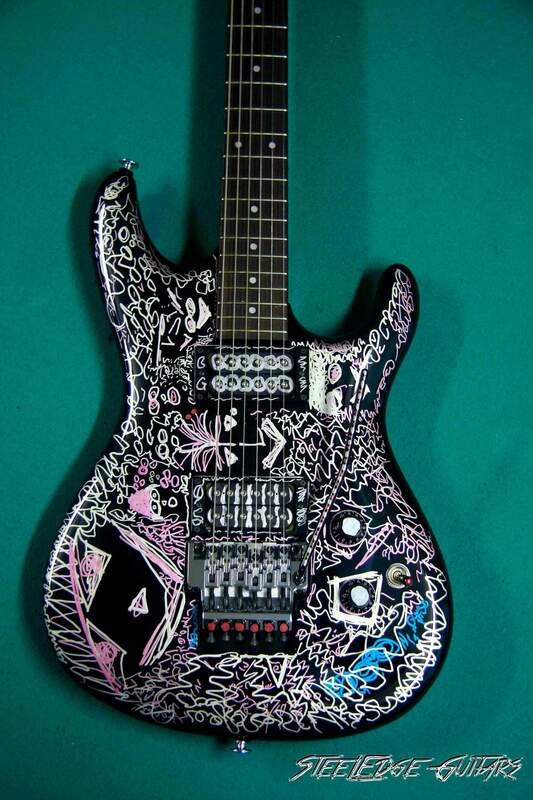 I started drawing on the guitar as soon as I started touring with it. The distressed black paint job had seen too much prototype work, and I felt the need to put some artwork on it. 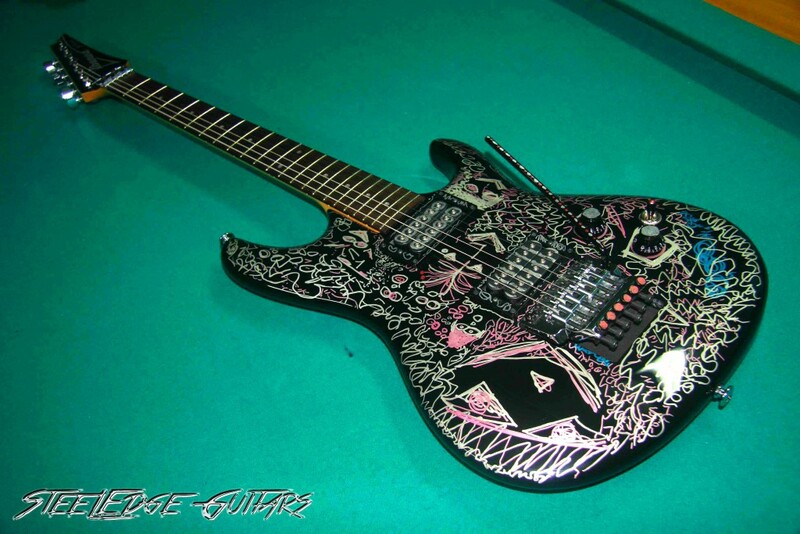 My wife Rubina, an artist herself, encouraged me to cover the entire guitar with my scribbles. Metallic paint pens seemed to do the trick, but the images would rub off almost as quickly as I drew them. There were some ‘golden moments’ however, where the multiple layered illustrations seemed to form a beautiful mosaic of sorts, and we would be fortunate to have it photographed, preserved for future reference. Little did I ever expect to have the illustrations replicated for an anniversary model! These replicas were made the small Ibanez Custom Shop in Nagoya being faithfully recreated by a Japanese doodler and built with the best woods available to the highest standards. The guitars that come out from Nagoya are well known for being the best guitars Ibanez makes. 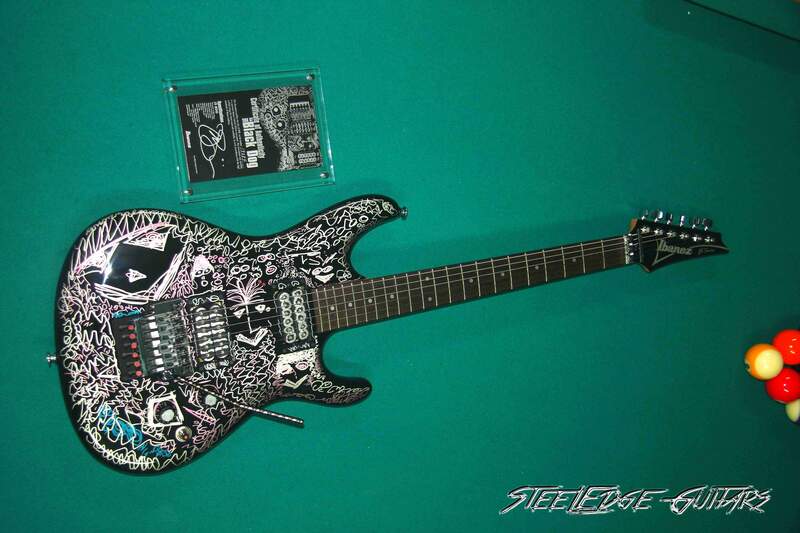 The graphic was under a coat of clear so that it couldn´t be rubbed off, but the doodles on the pickups, the mounting rings, the fine tuners, the pots and the bar were in relief.The guitar, as a collector limited piece of the Tribute Series, had a high price, 7999US$ MSRP, 5999US$ Street Price. 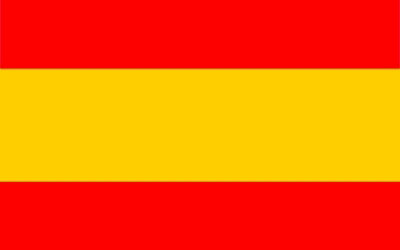 In Europe, you could grab one for 6.250.If you were lucky enough to find one…. The guitar is just amazing, an instant eye catcher and a dream for every Satch fan or even Rock Guitar enthusiastic. These very limited special editions use to come with a lot of case candy, the JSBDG comes with a beautiful Hardshell Case with a special badge, a Certificate Of Authenticity signed by Joe inside of a methacrylate frame (so cool! ), a LEGACY Special Edition 20th Anniversary Surfing With The Alien CD also signed by Satriani, a cool leather strap with Satriani graphics and 20th Anniversary logo, some Satriani pics, etc…. – One piece Maple Neck Prestige . – Multi-radius Fretboard Profile. 250mm Radius. – Push/pulls for single Split coil and high pass filter. – Black color and handmade Sharpie Drawings, with clear coat over the body. What can I say about this guitar…..is one of my childhood dreams come true, so iconic to me…since I saw Joe playing Black Dog in the Guitar Legends Concert at the Expo 92 in Sevilla, I was SO AMAZED by Joe´s playing and this guitar…is one of that moments that you snapshot and your mind and remains forever in your head, and that´s one of the reasons because this guitar is so meaningful to me.Watch that concert on TV, seeing Joe doing such amazing performance with that COOL guitar….it really blowed my mind. No need to mention that this guitar, due to his exclusivity and limited production (88 worldwide, having Joe 3 of them) makes this guitar a very rare and sought after collectible item, one of the Holy Grails for any Ibanez / Joe Satriani fan. I’m sure that, along with the Js2PRM, will be one of the most valuables / sought after guitars in just a few years. You just have to take a look back and see what people are paying now for a JS3 Donnie, a JS4 Electric Rainbow or a JS5 Rain Forest…. I was searching for a Black Dog intending to buy, but when they did pop up for sale, the prices were too high, here in Spain you couldn´t see one under the 5500 Euros price tag, and only a few came to Europe.There were some auctions on eBay, but the prices went too high and I didn´t have that money, though I know the Black Dog was a good investment…so I put it in my “Wish List” in case I´d win the lottery. One day, I saw a store that was making a big sale, I asked for a listing and…surprise! There was a JS Black Dog, along with a JS 20th (the one with the Silver Surfer on the body in relief).He told me that he could give me a very good price if I´d buy both, distributor price. 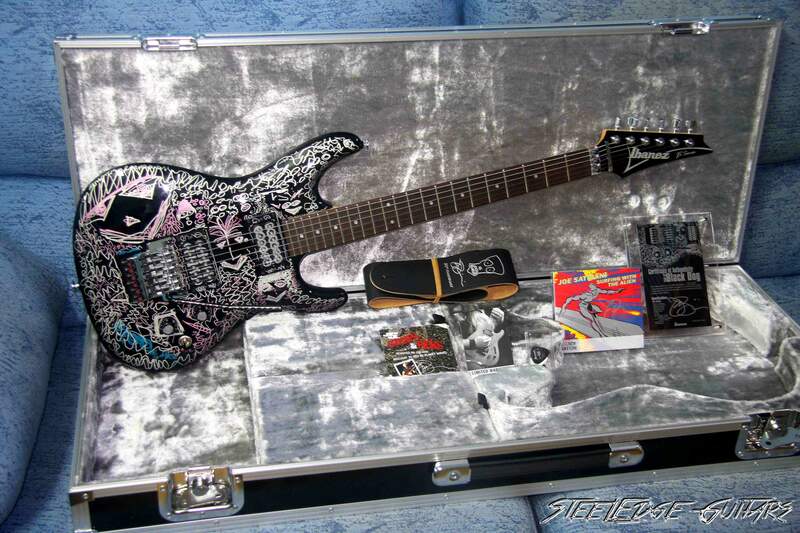 The offer was VERY TEMPTING, but I didn´t had that money, and also I really never digged the JS20th, so I emailed him asking if he could maintain the price just for the JSBDG, but he told me that was not possible, so…I thought that was it.One more time, my dream of owning this guitar was so close…and still so out of reach…. I mainly give up and tought that I should sell some guitars of my collection to have money enough to pay for a Black Dog, and be lucky of finding one when I got the money.I was really pissed off, because I was so close of a bargain on such awesome guitar…. But…couple of weeks after that I got an email from the seller saying he already sold the JS20th and, if I was still interested, he could maintain the “Special Pack Price” of the JSBDG…so I didn’t hesitate for a second and emailed back asking for the payment method 😉 As usual, buying overseas is a big adventure, but resuming, the guitar came home perfectly, brand new and in the original card box, at a price that, I might say was VERY GOOD! With this guitar, I own 4 Joe Satriani Signature guitars, 4 guitars that are a pleasure to own, look at and play. 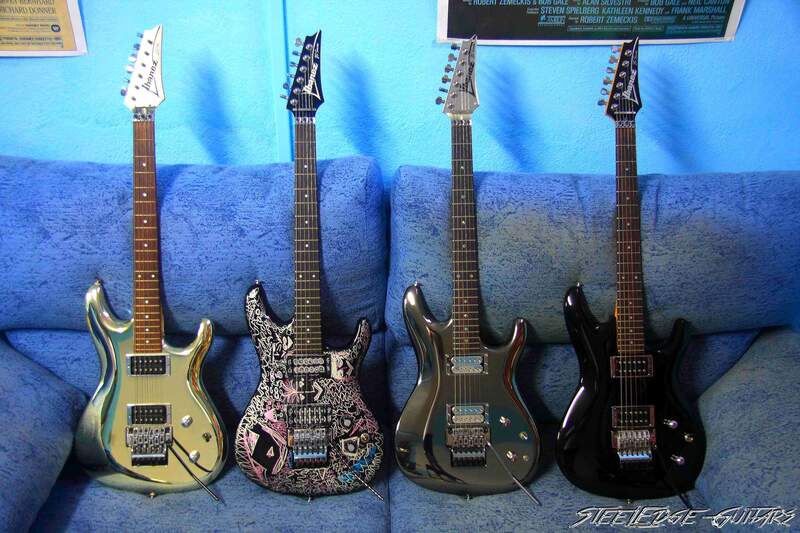 Here you have a pic of the fantastic four together: the Js10th (my most beloved guitar, played and signed to me by Joe), the JS Black Dog, the JS2PRM “Alumiboy” (the other Chromeboy and main guitar of Joe for a long time since was released, also the most limited one, with only 60 ever made) and the classic JS1BK, the first JS Guitar ever produced. 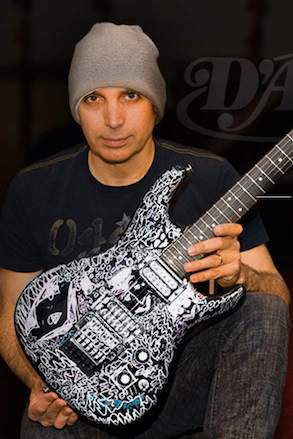 As a Joe Satriani fan, Ibanez lover and guitar collector, I´m very proud of this pic, really love to look at it!